1.8 How to preserve royal jelly? Royal jelly is a bee product, which is obtained from bees. It consists of food specially made by bees for the queen of the hive. 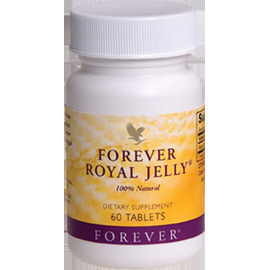 Royal jelly is generally sold in tablets or capsules, such as this one from Forever. – Tonic effects: Most people who have undergone a cure with royal jelly seem to experience positive effects on their well-being. In general, we can say that they are better, both physically and mentally. Its consumption generates confidence in personal possibilities and a greater sense of self-affirmation. It is convenient to supply it in cases of fatigue, seasonal changes or spring asthenia. – Antioxidant effects: Royal jelly has antioxidant properties, very suitable to prevent degenerative diseases caused by free radicals. Due to its antioxidant effects it is attributed a great capacity in the prevention of the development of cancerous cells. – Regenerative effects: We can say that the ingestion of royal jelly produces a general improvement of the organism by stimulating the cellular formation which produces a regeneration of the organs, especially as regards the care of the skin, the bones or the cells of the nervous system. Its regenerative capacity makes it particularly interesting in cases of premature aging. Used internally, the skin appears more alive and healthy. It can also be applied externally to combat wrinkles, to prevent dryness of the excessive sebum. Its high content in vitamins of group B makes it ideal to balance the nervous system, being a natural substitute for anxiolytics. It will be used in case of nervousness, anxiety, stress, insomnia, irritability or more serious psychological problems such as depression or negative symptoms derived from drug use. Similarly, its high content of acetylcholine, one of the major neurotransmitters of the nervous system, can help improve communication of nerve impulses, being particularly interesting in the treatment or prevention of degenerative diseases such as Alzheimer or multiple sclerosis. It acts on the bones of the human skeleton, being able to stimulate its growth and to repair diseases of the bones, like fractures or sprains. It is beneficial to avoid or treat osteoporosis. – Antibacterial and antiviral effects: The antibacterial and antiviral capacity of royal jelly has been verified in some in vitro studies. It has been found to be capable of inhibiting the growth of well-known viruses and bacteria, especially as it relates to the influenza virus. However, the highest antibacterial effect has been attributed to the application of royal jelly for external use on the skin. In this case, it has been particularly interesting in the healing of wounds, burns, cuts, etc. On the other hand, its ability to stimulate defenses helps boost immunity and makes it a good remedy for preventing numerous microbial diseases, such as colds, bronchitis or other infections. – Antianemic effects: Its ability to stimulate the production of red blood cells makes it particularly interesting in cases of anemia. – Cholesterol reduction: Studies in animals showed a significant reduction in cholesterol when they were given royal jelly in their diet. Its use in humans can be very interesting in this sense because, by lowering cholesterol, it can help prevent the occurrence of thrombi in the blood or atherosclerosis, preventing vascular accidents, such as angina pectoris or heart attacks. It is a good regulator of blood pressure, being able to increase it in cases of hypotension or decrease it in case of hypertension. – Blood sugar reduction: Similarly, animal studies have shown how royal jelly is able to lower the level of glucose in the blood, so it could be useful for the treatment of diabetes. – Eating disorders: It has been proven that numerous eating disorders can be improved with the use of this supplement. It is ideal in cases of anorexia, resulting in patients experiencing a greater desire to eat. It is a suitable reconstituent to strengthen the diet of these people, as well as it is highly recommended for elderly or inappetent children. Royal jelly is a very perishable product that, over time, becomes rancid and loses many of its properties. The unprocessed royal jelly should be stored in temperatures from 0 to -5 ºC, better to keep it below -17 º C. This way it is recommended to keep unopened for up to 18 months. Once opened, it should not be stored in the refrigerator for more than 12 months. Processed royal jelly can hold up much more. It is usually preserved at room temperature although it can be preserved, and is best done as such, as unprocessed royal jelly. Once the package is opened it is best to consume it within the treatment period. Real jelly can cause allergic reactions in certain people both used externally and internally. Therefore it is recommended to take it at first in small doses and stop taking it in case of experiencing negative reactions. The usual dose is between 100 and 300 mg. Daily, being 500 mg. a widely used dose. Never take more than 1000 grams. In the case of children, the dose should be reduced by half or by one third. Real jelly should NOT be given to people with Addison’s disease, allergic or asthmatics. In some patients it can produce an excessive hormonal stimulation. In this case, it is recommended to abandon the treatment. The ingestion of royal jelly in high amounts or for longer than normally is counterproductive. It is advisable to carry out treatments from 30 to 40 days in length. Afterward, we should rest for a month before starting a new treatment. More information on royal jelly, honey and other bee products.